Welcome to Online Quants Test in AffairsCloud.com. We are starting Cumulus Course for SBI PO 2018 Prelims Exam and we are creating sample questions in Quants section, this type of Question will be asked in SBI Clerk 2018!!! What is the difference between the profit of company S and T over the year 2010, 2012 and 2014 together in crore? For company T. total profit = (216-160) + (294-216) + (348-294) = 56+78+54 = 188 croreTherefore, required difference = 188-174 = Rs. 14 crores. In which year was the income of company T, second lowest? By what percent the profit of company S increased from 2011 to 2012? The profit percentage of company S in 2015 is approximately what percent of the profit percentage of company T in the same year? Mean value of 100 samples was 46. 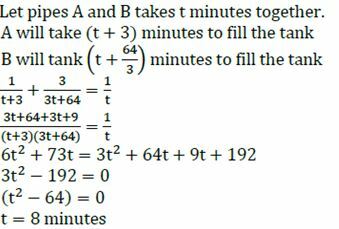 Due to error it was discovered that a sample value 16 was misread as 61 and another sample 43 was misread as 34. It was found that the number of samples was 90 and not 100. Then what is the correct mean? Two varieties of wheat – A and B costing Rs. 9 per kg and Rs. 15 per kg were mixed in the ratio 3: 7. If 5 kg of the mixture is sold at 25% profit, find the profit made? Let the quantities of A and B mixed be 3x kg and 7x kg. Let the salary of Raju, Sohan and Amit be x, y and z respectively. Now, 14 2/7% of (x + y) = 100/7 * 1/100 * (224+168) = 392/7 = 56. One fill pipe A takes 3 minutes more to fill the cistern than two fill pipes A and B opened together to fill it. Second fill pipe B takes 64/3 minutes more to fill cistern than two fill pipes A and B opened together to fill it.When will the cistern be full if both pipes are opened simultaneously?